»Arabic»Madinah Book 1-Class 8 Notes by Ustaadhah Sameerah Al Harbi. Taking sentence هو في الغرفة . In this , ”هو ” is ”اسم”. Which type of اسم? It is Pronoun ضمير. It is, ”مبتدأ”. ”في الغرفة ” this is semi part of sentence we call in Arabic , ” شبه جملة ”. The شبه جملة is خبر and خبر is made up of two words. 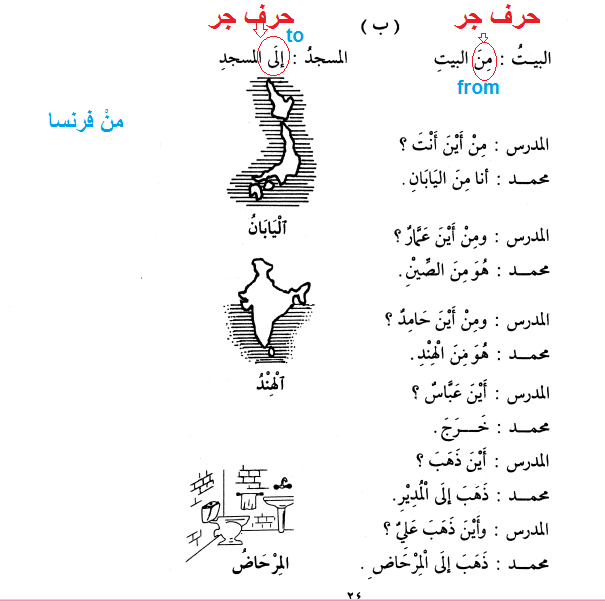 It have في which is حرف جر and it have الغرفة which is اسم مجرور. Due to influence of في the noun after it which is الغرفةِ got Kasrah ending. جملة الإسمية :Sentence starting with noun. جملة الفعلية: Sentence starting with verb. شبه الجملة الجار والمجرور: Semi sentences (in English phrases). These are two types Al-Jaar meaning Harf Jar And Al Majroor means the noun that comes after Harf. شبه الجملة الظرف: Semi sentence of Adverbs. Taking sentence , .أين عباس؟ خرج :The full stop after خرج means this is complete sentence. How can we have one word as sentence? ?أين عباس means Where is ‘Abaas. And خرج means He went out. So, where is , ”He” in this sentence as we don’t see it. Principle : The Doer (means the one who did the action) can be visible in the sentence or it maybe hidden. The hidden pronoun here is, ” هو ”. Hence, ”خرج هو ”.
. خرج عباس <–In this sentence the Doer (فاعل) is shown. .أين عباس؟ خرج<– In this sentence the Doer is hidden. Someone asked already mentioning the name about ‘Abbas that where is ‘Abaas? The Answer is , ”He went out”. The Doer ”He” is hidden because it is understood but not mentioned in pronunciation or written form.Hence. because of the form of the verb we immediately know ,” هو”. .كتب محمد رسالة (Mohammad wrote a letter) : <—In this sentence, it is madeup by verb +Doer+receiver. 4. ماذا كتب محمد؟ What did Mohammad wrote? <—-This sentence is totally different from those above. In asking question we already mentioned name of Mohammad so in answer we use suitable pronoun. And say, ”كتب رسالة ” (He wrote a letter). In this case pronoun is hidden. 5: . أين ذهب ؟ ذهب إلى المدير <—-(Where he went ? He went to the headmaster. )In this sentence the doer is hidden because it is understood we are still asking about ‘Abbaas. Principle : جملة الفعلية always have a verb and Doer. Doer can be hidden or shown but this do not matter rather what matter is it is always in sentence. Notes by Ommo ‘Abdillah Al Baakistaaniyyah. From the Dars of Ustaadhah Sameerah Al Harbi.